We are looking for a support engineer for our WP RSS Aggregator plugin project, and other plugins we have in the pipeline. Experience in supporting WordPress users. You don’t need to be a developer, but we’d prefer someone who’s used WordPress and has experience in helping others use it. We’ll still train you of course but since this is a remote position some base knowledge is needed. Excellent command of the English language. If you speak other languages in addition to English that’s obviously great. Some base technical skills are needed. For example editing .htaccess files, uploading/removing plugins through FTP etc. If that’s abracadabra to you, this job is probably not for you. Be available for at least 15 hours a week on a freelance basis. Feel the thrill of making the lives of tons of people better. If this sounds like the perfect job for you, please use the form below to apply. 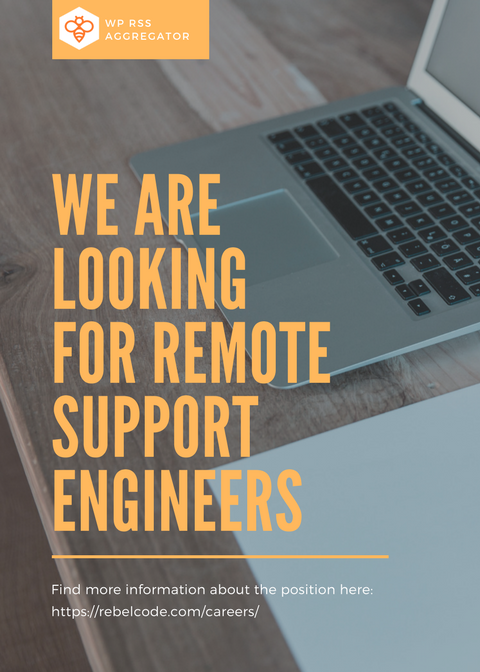 We're Looking for Remote Support Engineers! Here's a quick post to share with you my favourite articles relating to plugin and theme support.